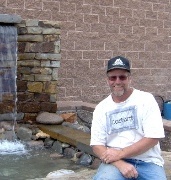 Modern Landscaping LLC is a family owned business based out of beautiful Ridgway, Colorado. Dan Zaugg has been running the show since 1978 and has acquired an impressive resume of projects with a fair share of challenges overcome along the way. Dan’s approach to landscaping construction can best be summed up by this statement: “Bring in the right equipment, plan for success, get it done and get it done right the first time.” Modern Landscaping has made significant investments in tools and equipment to live up to that statement. Download our current equipment list here. “Working in this beautiful region is truly a blessing. Besides the incredible natural beauty that surrounds us all we get to work with some really great folks. I love being able to interpret our clients’ wishes using heavy equipment, irrigation, sod, shrubs, boulders and beauty bark! It’s very satisfying to stand a few paces back with our new friends and see what we’ve been able to accomplish together. Transformed outdoor spaces! It is important to me that you understand what’s a little different about us. We’re not your run of the mill landscaping company and we’ve worked hard to be able to say that. We’ve made serious investments in heavy equipment and light tractors that allow us to operate more aggressively on behalf of our clients. What I mean by that is we arrive at your property with serious capability and not a pickup trick with a few garden implements. We even have our own material yard! This makes a big difference to what we can do and how quickly it can be done. …that we can build retaining walls from large stone and boulders. No subcontractors needed. …that we get the job done much faster than our competitors. Need twenty trees removed and the ground contoured into five pleasing mounds for plantings? We’re talking a couple days instead of weeks. This means significant time and money savings for our clients. ….drainage improvements and culvert construction are done in a flash. Contractors regularly call us to make these improvements for them because we understand water flow and how it affects a lot. ….water features with boulders and complex pumping mechanisms are a core part of our expertise. You need real equipment and experience to build those eye-popping additions!